I can honestly say that this is the BEST crumb cake I’ve ever eaten. Want to know something funny? Until I made this cake I’d never cooked a sweet potato. Actually, if I’m being truthful, until I made this recipe I’ve never even eaten a sweet potato, unless you count restaurant fries. I know, I’m a sorry excuse for a food blogger, aren’t I? Growing up, no one in my family liked sweet potatoes. They never appeared on our Thanksgiving table. Sweet potatoes are trendy now but back then they only showed up once in awhile covered in marshmallows. No one I knew would touch them with a 10 foot pole! Then I got married to Mel and the mere thought of a sweet potato turned his stomach. See? 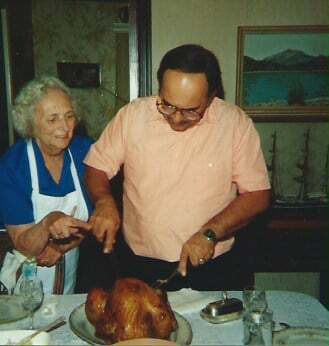 That’s my dad and my Nana one Thanksgiving. Turkey, check. Knoepfle, check. Sweet potatoes? Nope! But, as I’ve gotten older, I’ve gotten more adventurous. I still haven’t cooked a sweet potato for dinner, but I have ordered them as french fries (and those suckers are goooood). 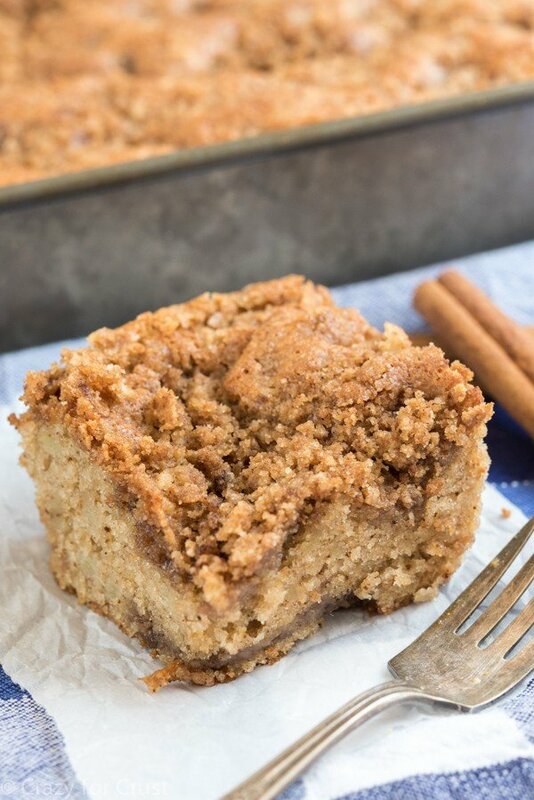 So what would make me, the picky non-sweet potato eater, make a sweet potato crumb cake? When I received my copy of Grandbaby Cakes I couldn’t wait to dig in. The book is almost like a novel – every recipe has family photos and stories about the recipes and her family. The tagline of the book is “Modern Recipes, Vintage Charm, Soulful Memories” and it totally encompasses all of that. While reading the book I could see myself in the kitchen with Jocelyn, her mom, and her grandmother. The thing about this cake is that I could see myself eating it for breakfast with coffee or for dessert with wine. There are a few steps involved in making it, but they’re worth it. The cake itself is pillowy soft, probably because you whip the egg whites before adding them to the batter. There is a ton of streusel all throughout this cake. I love that about any crumb recipe – there needs to be a lot of it! The crumb is sweet and crunchy, a nice accompaniment to the moist and soft cake. It may have been a hot summer day outside when I was baking this, but the inside of my house smelled like Thanksgiving. And if the thought of a “sweet potato” dessert makes you a little wary – don’t be. This cake does not taste like a french fry, I promise. 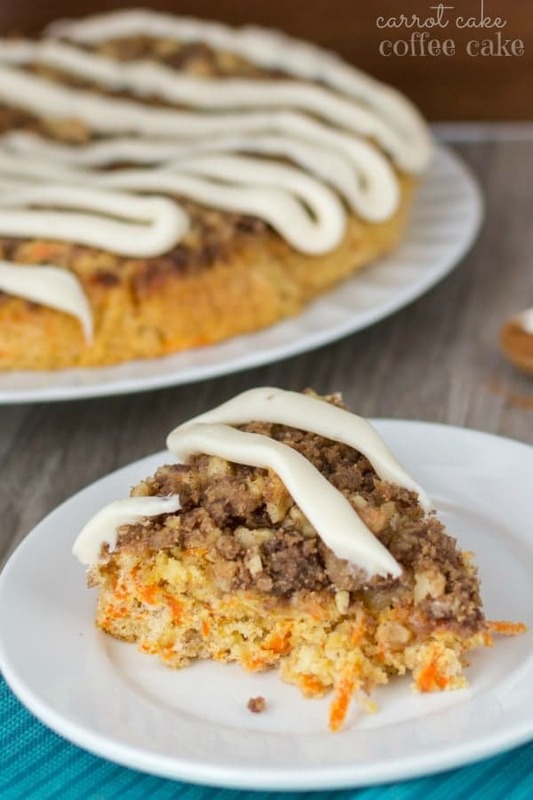 I liken the sweet potato in this cake to making potato rolls. The starch in the potato just makes the recipe that much fluffier! This is the perfect recipe to make the day after you’ve baked sweet potatoes for dinner. You need about 2 baked potatoes for this recipe. You can bake them special to make the cake, but if you have leftovers it gets even easier. If you’ve never baked a sweet potato before, you just pop them in the oven wrapped in foil and bake them until soft; it’s just like baking a regular potato. Once you can handle them, peel the skins off and mash the potato before adding it to the cake batter. I’m serious you guys, this cake is going to happen over and over again. I had to get it out of my house as soon as I made it or there would have been trouble. 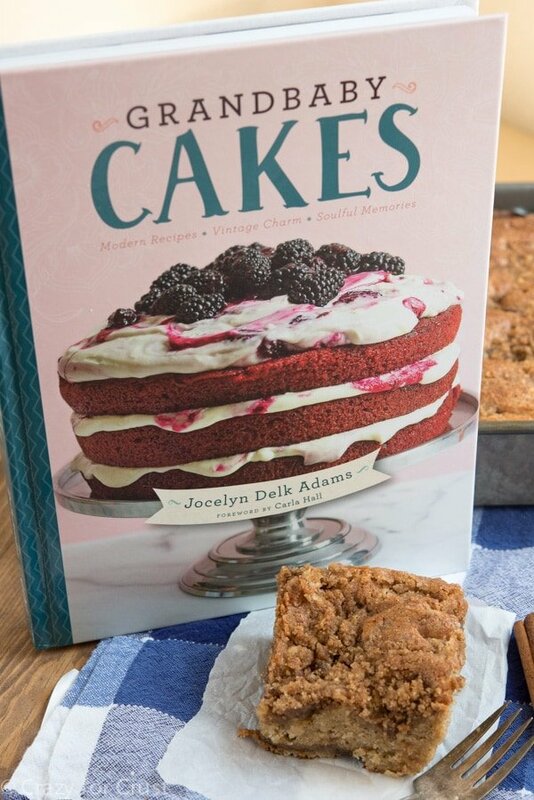 I think that all the cakes in Jocelyn’s book are going to be fabulous. This is the perfect gift you need to give for Christmas. It’s the kind of book that will be handed down for generations, that’s for sure. I get a lot of cookbooks to review, you guys, and this one is top notch. From Classic Yellow Cake to 7Up Pound Cake to Caramel Cake and Red Velvet, this book has it all. Okay, so one last photo. Of me. 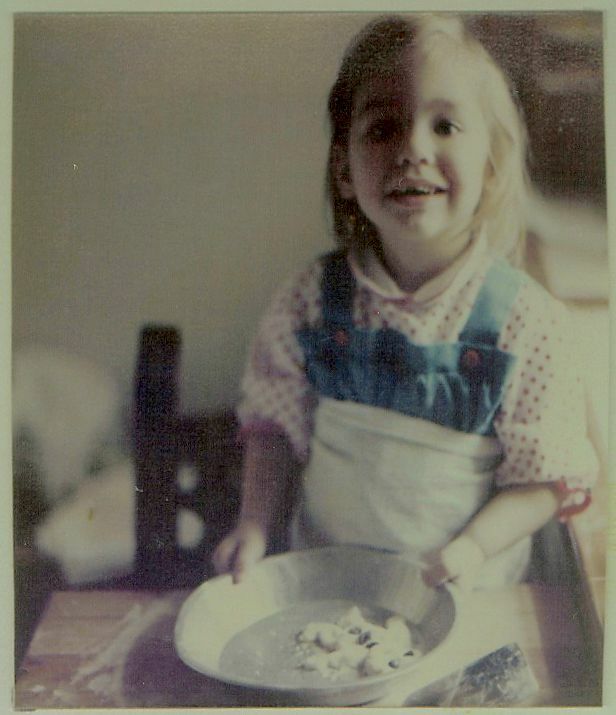 Baking when I was oh-so-small. It all started here, my friends! 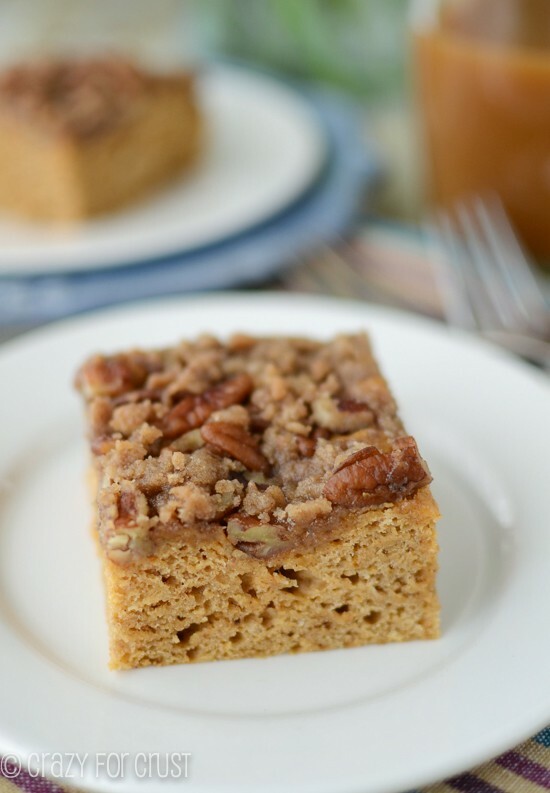 This Sweet Potato Crumb Cake is my favorite crumb cake EVER. It's easy, moist, rich, and full of flavor! And it makes your house smell like fall! Preheat oven to 350°F. Line a 9x13” pan with foil or parchment paper and spray with nonstick cooking spray. 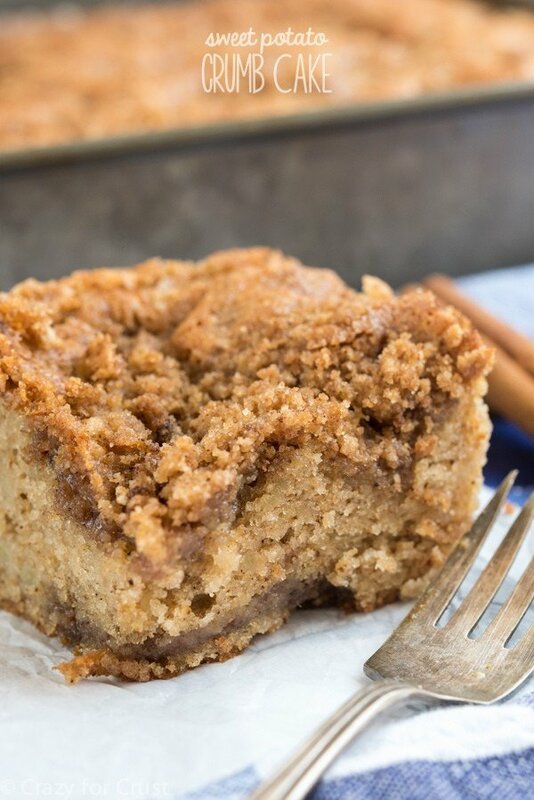 Make the streusel: in a medium bowl, whisk flour, brown sugar, granulated sugar, and cinnamon. Slowly add melted butter and whisk until crumbs are formed. The mixture will look wet, but it’s supposed to look that way. In the bowl of a stand mixer fitted with the whisk attachment, beat the egg whites on high speed until stiff peaks form. Transfer the egg whites to a small bowl and chill until ready to use. Clean your stand mixer bowl and switch to the paddle attachment. Beat the granulated sugar and oil on medium-high speed until combined. Add the egg yolks 1 at a time, combining well after each addition and scraping down the sides of the bowl as needed. Add the mashed sweet potatoes, hot water, and vanilla and beat for another 3-4 minutes. Turn your mixer to it’s lowest speed and carefully add the flour, baking powder, cinnamon, cloves, salt, baking soda, and nutmeg. Mix until the batter is just combined, being careful not to over mix. Remove the egg whites from the refrigerator and gently fold them in using a spatula or wooden spoon. Pour half the batter into the prepared pan. Top with half the streusel. Repeat with remaining batter and streusel. Bake for 55-65 minutes until a toothpick comes out moist but mostly clean. Let cool in the pan. Serve warm or room temperature. Store tightly covered at room temperature for up to 3 days. The giveaway will run from September 15th- October 5th. 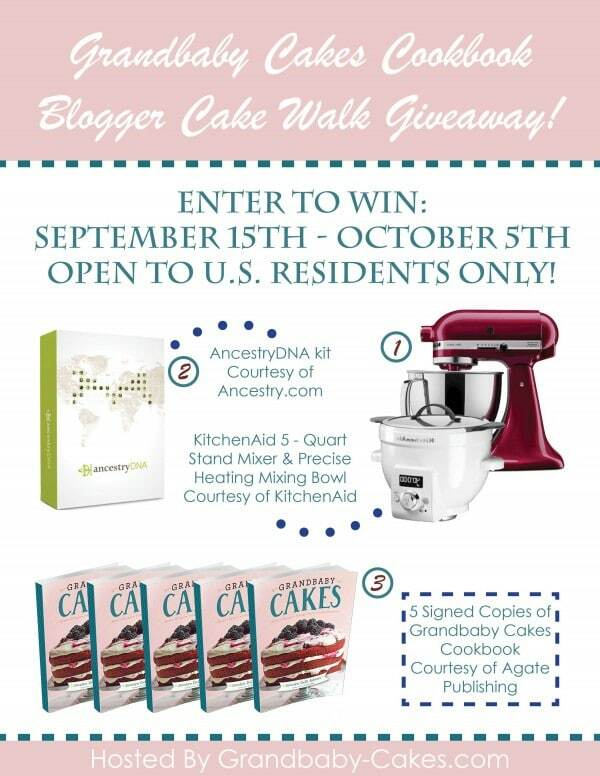 Winners will be randomly selected on October 6th and notified via email. The contest is only open to United States residents. All items will be shipped separately by each brand. No purchase necessary to enter, void where prohibited. Please enter using the rafflecopter form directly below this paragraph. Good luck! I made this for a potluck breakfast at the office. 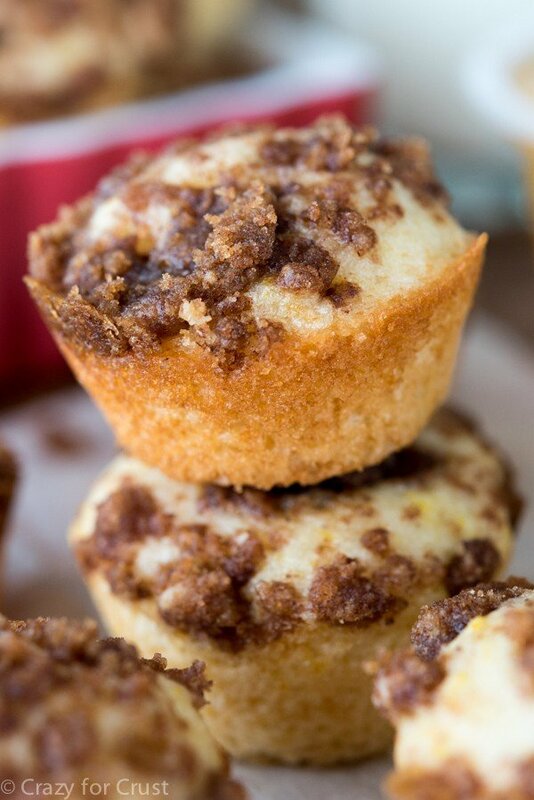 People were going crazy over it, especially the streusel. I’m not sure they even realized it had sweet potato in it. It was wonderfully late, likely because of the lights being whipped and then fold it in. I did add a half a cup of chopped toasted pecans to the streusel mix, which didn’t hurt a bit. I also served 3 1/2 teaspoons of Penzeys cake spice for the spice mix in the cake batter. I did not line the cake pan, just sprayed it with coconut oil baking spray and had no problems with lifting out by the piece for serving.